That was many years ago, when I saw my first lizard walking on water. It’s the common name for the basilisk lizard genus, known for its unique ability to walk and run, as a biped, across water. Basilisks are native to the tropical rain forests of southern Mexico, Central America, and northern South America, meaning they’re non-indigenous to Florida. To date, the furthest north they’ve been spotted is Ft. Pierce. 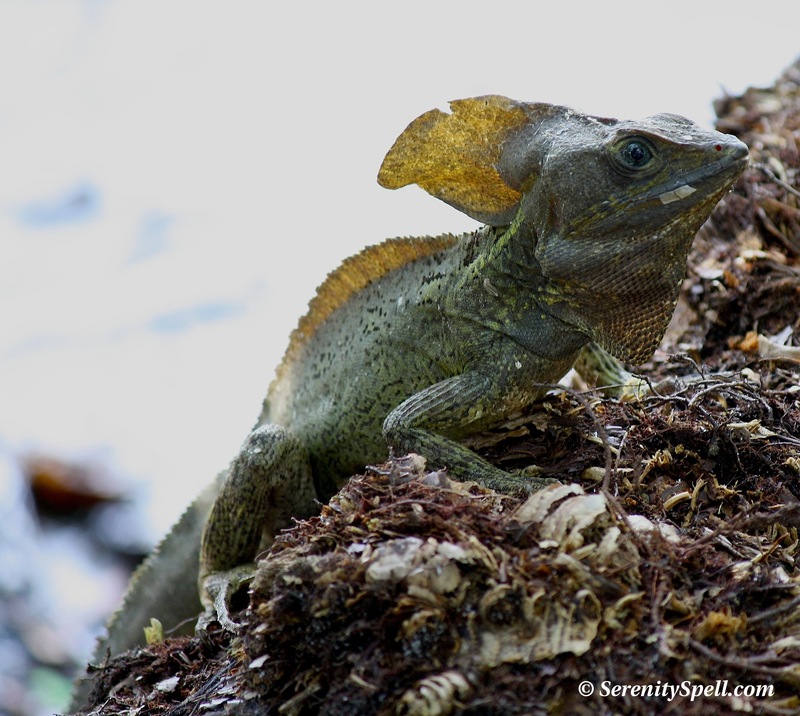 Part of the iguana family, basilisks can reach 2 feet in length, including their long tail. The high crests on the males’ heads and backs are used to impress females. 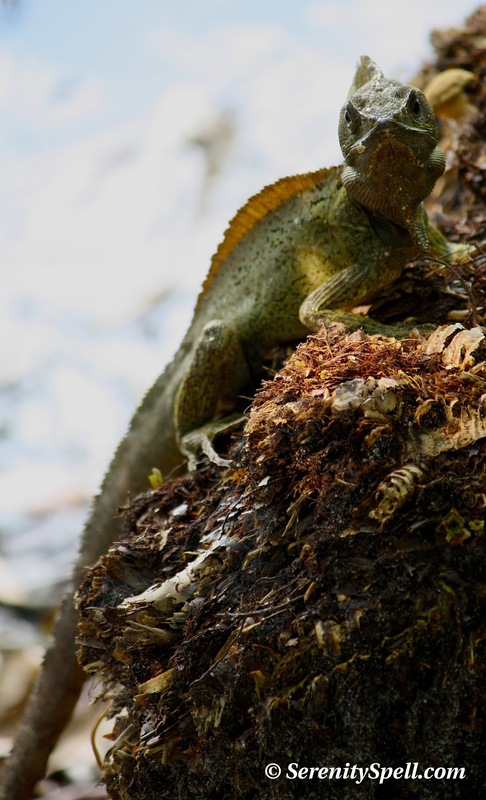 On water, basilisks can run on their hind limbs at about 5 feet per second for approximately 15 feet, before sinking to all fours and swimming. I’ve often seen them running across solid surfaces as well however, and this National Geographic article describes the complicated mechanics of the basilisk lizard’s movements. During times of danger, basilisks will swim at fast speeds, using their crests as rudders. They also burrow in the sand — a ring of muscles around both nostrils prevents grains of sand from entering the nose. Since being introduced to Florida, and a slightly cooler environment, they’ve taken to burrowing in the leafy undergrowth (something I commonly witness). Although they’re not huge — big enough to notice, for sure — they definitely have a prehistoric air to them. I call them Little Godzillas whenever I see them on our hikes. And their name helps this primeval aura…. BASILISK. I hope they can stay safe in their selected home; they’ve chosen an area which is now home to no less than three alligator nests — slightly larger reptiles. 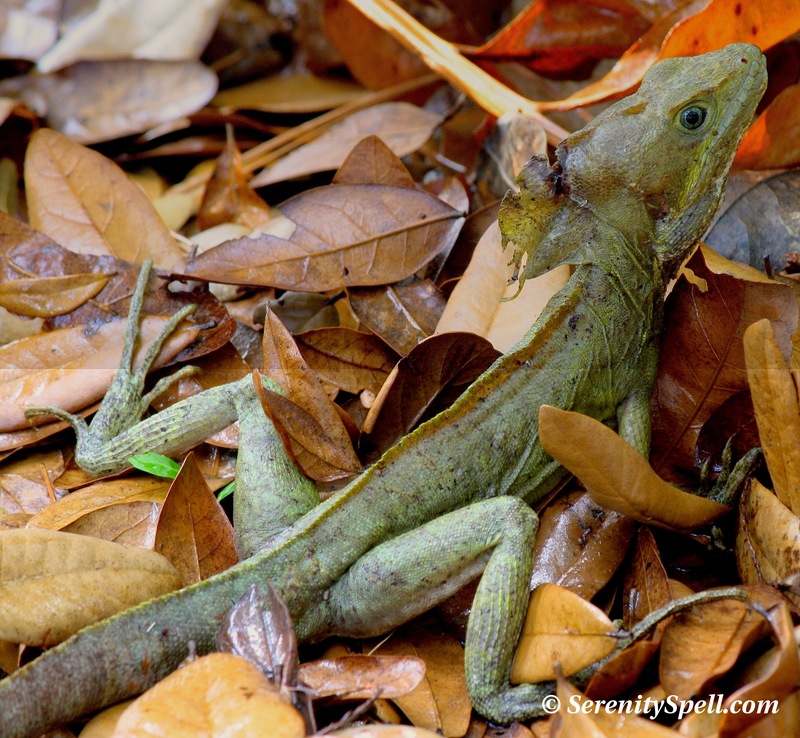 Basilisk Lizard (Jesus Lizard) in the Florida Wetlands: Hello, FACE! I call them Little Godzillas — they definitely have an air of prehistory about them! 🙂 Have a wonderful weekend! Thanks for letting me camp out in your blog for a little while. Except for the slow loading of all of your pictures, I had a great time and tried to leave my campsite as clean as when I arrived. I’ll be back! You can resize your own pictures so that you don’t have to rely on WordPress. It’s probably much faster to do it yourself. Virtually any digital photo editing program will let you do it. I used 575 pixels on the longest side for my pictures, and when I resize those 5 MB pictures to 575 pixels long side they are a whopping 75 KB or so, making them load instantaneously. Thanks so much, again — I honestly never even thought it was necessary, especially since I never heard anything! I REALLY appreciate. TRULY. I can’t believe I spaced on that one. AS USUAL- GREAT SHOTS. LOOKING AT LIZARDS SOMETIMES MAKES ME THINK OF MINIATURE DINOSAURS – MAYBE THE MORE GENTLE ONES , IN ANY CASE!!! Heh, thanks so much! These guys were tough to capture for sure — it was getting dark (8 PM) both times, and they are very herky-jerky. Not the easiest models (very shy). 🙂 I find them a bit cute, in their reptilian selves — hah! Sadly, another Russel Ray camping trip comes to an end………………..